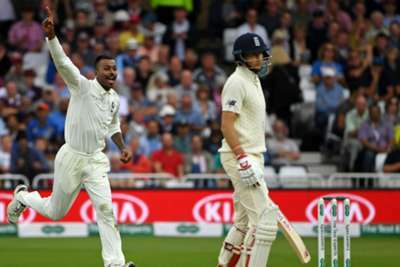 Hardik Pandya claimed his maiden five-wicket Test haul as India skittled brittle England in the afternoon session to take a firm grip of the third Test on a frenetic day two at Trent Bridge. Stuart Broad and James Anderson took two wickets apiece to dismiss the tourists for 329 after they had resumed on 307-6 under grey skies in Nottingham on Sunday. England were going along nicely on 54 without loss just after lunch, only to collapse to 161 all out a week after they had torn through India for a second time at Lord's to take a 2-0 lead in the five-match series. The India bowlers gave England a taste of their own medicine in ideal conditions for swing bowling, all-rounder Pandya striking with his first ball to remove Joe Root somewhat contentiously as he claimed outstanding figures of 5-28 from a devastating six-over burst. Wicketkeeper-batsman Rishabh Pant took five catches on debut, while Jasprit Bumrah (2-37) and Ishant Sharma (2-32) were rewarded for probing spells before India closed on 124-2, meaning they lead by 292 runs. Broad (3-72) got an early breakthrough after the start was delayed by 30 minutes due to a wet outfield, Pant chopping on for 24, and the paceman also removed Ravichandran Ashwin's middle stump with a magnificent inswinger after Ollie Pope had dropped a sharp chance. The excellent Broad also bowled Bumrah before ending the innings just 7.5 overs into the day's play, holding on to a catch when Mohammed Shami tried to launch Anderson out of the ground. Alastair Cook (29) and Keaton Jennings (20) looked comfortable for the remainder of the morning session, scoring freely in a promising stand, but England fell to pieces after both openers were removed from successive deliveries. Cook edged Ishant behind two balls after he was put down by Cheteshwar Pujara at first slip and Jennings fell in the same manner wafting at a tempter from Bumrah at the start of the next over. Pope was strangled down the leg side off Ishant - who curiously did not bowl before lunch - and Pandya made his presence felt immediately, claiming the big wicket of Root, who shook his head as he trudged off for 16 after KL Rahul was adjudged to have got his fingers under the ball to take a low catch at second slip. Ashwin spent a lengthy spell off the field due to a hip injury, but the spinner would not have been needed in any case as the seamers continued to reap the rewards of pitching the ball up, Ben Stokes and Jonny Bairstow also edging to the safe hands of Rahul. 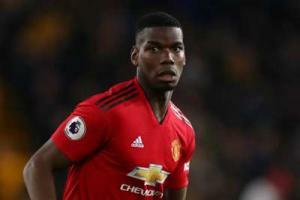 Pant reacted superbly to cling on to a one-handed catch when Chris Woakes feathered behind trying to hook Pandya, who raised the ball aloft after trapping Broad bang in front to pick up his fifth wicket of the innings. Jos Buttler went on the offensive with Anderson for company, striking two sixes in a rapid 39 from only 32 balls before he was taken in the deep attempting to clear the ropes for a third time. Stokes ended a brisk, assured opening stand of 60 by cleaning up Rahul (36), while Shikhar Dhawan (44) was stumped after failing to read an Adil Rashid googly after he was dropped by Cook. A watchful Pujara was unbeaten on 33 at stumps and Virat Kohli came through a barrage of short stuff from Stokes with the sun out and India in complete control.